Sea turtles have roamed the ocean for over 150 million years, but now, their reign is rapidly ending because of plastic pollution in the ocean. The ocean is quickly becoming plastic soup. Researchers have estimated that more than 8 million tons of plastic end up in our ocean, annually. If you have problems grasping the sheer size of that figure, try and imagine a truckload of plastic being dumped into the ocean every minute! Plastic pollution affects sea turtles throughout their lifecycle. From the moment they are born, they face the risk of injury – or worst: death - because they ingest or get entangled in plastic. Researchers estimate that over half of all sea turtles in the world have ingested plastic. And a single piece of plastic has a 20% chance of killing them. You might be wondering why sea turtles and plastic pollution is something you should care about. Keep on reading and we’ll explain why caring about the wellbeing of our sea turtles has an impact on you too. And most importantly, we’ll let you know what you can do to help, both at home and as a turtle Conservation volunteer. Why is it important to save sea turtles? The critically endangered hawksbill turtle protects coral reefs by grazing on sponges that would otherwise outgrow the corals. If sponges were left to grow unchecked, they would cover the corals and kill the reef. The endangered green turtles graze on seagrass beds, which promotes healthier and faster seabed growth. This is important because seagrass beds are homes, nurseries and feeding grounds to many species of fish and other marine animals. The vulnerable leatherback turtle’s main food source is jellyfish. Jellyfish eat larval fish and if they are left unchecked, jellyfish will reduce the population of fish in the ocean. Fish populations are already under heavy stress from overfishing and pollution. Having to battle yet another threat puts immense pressure on the ecosystem, which is in danger of collapsing. Protecting sea turtles is essential for a healthy ocean. According to scientists, our oceans produce more than 50% of the world’s oxygen thanks to ocean plants called phytoplankton. This means we are even more dependent on the health of our ocean for survival. Why is plastic pollution killing sea turtles? Laying eggs. Sea turtles lay their eggs by digging holes in the sand. Sometimes there is so much plastic on nesting beaches that the female turtles aren’t able to dig through the waste. They simply give up on laying their eggs. 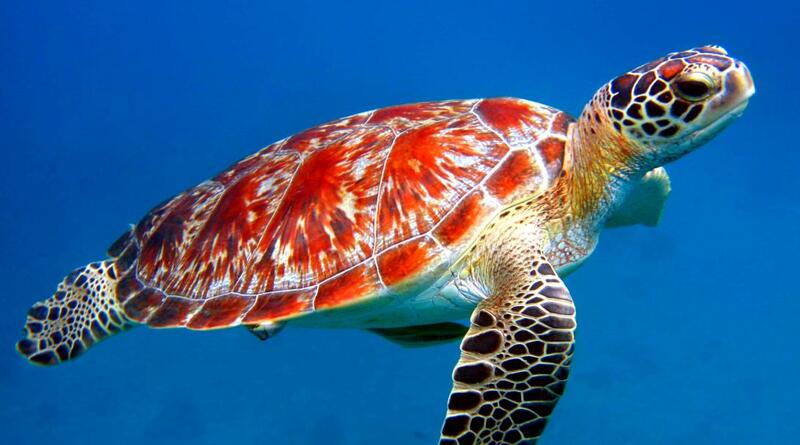 Six out of seven sea turtle species are endangered and only as few as 1 in 1,000 eggs will survive to an adult turtle. It’s therefore crucial for the survival of sea turtle species, that female sea turtles can successfully lay their eggs. Trying to find their way. 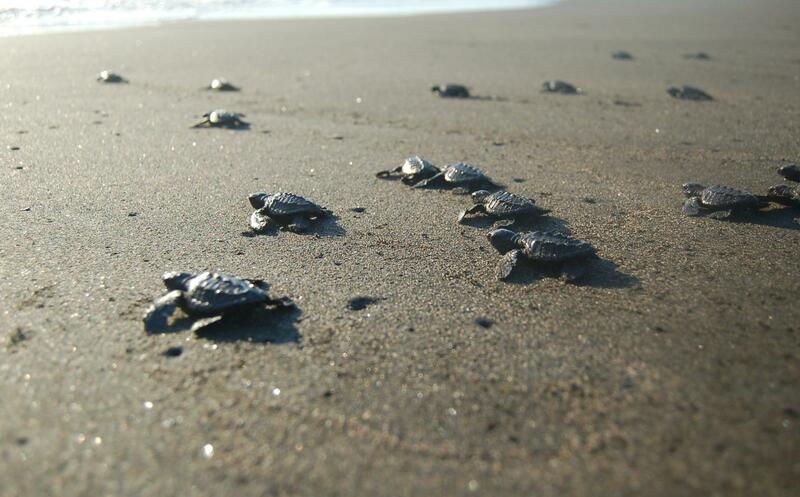 You might have seen beautiful photos of tiny turtle hatchlings scurrying towards the sea. If the beach is full of trash, the turtle babies can get disoriented or entangled. Instead of making it into the ocean, they die on the beach. Eating plastic. When it comes to ingesting plastic, hatchlings and young turtles are especially vulnerable. They haven’t yet developed the elder turtle’s sense of fine dining, and - simply put - are not as picky about what they eat. When turtles ingest plastic it might cause injuries to internal organs and cause intestinal blockages in the stomach. This results in malnutrition, reduced growth rate and death. Even though the adult turtles become wiser about their eating habits with age, sometimes the luring thought of a snack makes for bad choices. Plastic waste that looks like a sea turtles natural food is more frequently eaten. As an example the endangered Galapagos green turtle’s favourite food is jellyfish. Plastic bags that float in the ocean look very similar to jelly fish and if a turtle ingests a plastic bag, it can form fatal blockage. So how many turtles die from plastic bags every year? The reality is, no one knows. Researchers estimate that over half of all turtles in the world have ingested plastic in various forms. What we can be sure of is that many turtles will starve to death with stomachs full of plastic. Getting entangled. Another threat that sea turtles face daily is the risk of getting entangled in plastic waste. Plastic waste is everywhere, on the surface of the ocean, under water and on the beach. It is estimated that more than 1,000 turtles die every year after getting entangled in plastic, and this number is almost certainly a gross underestimate. Reduce. Every plastic piece you don’t buy, is one less piece of plastic that can end up in the ocean. If you stop buying plastic, you’ll send a signal to companies all over the world to reduce their plastic packaging. Avoid single-use plastic. Use a reusable shopping bag instead of a plastic bag and opt for a reusable or paper straw instead of a plastic one. Watch out for hidden plastics like tea bags, chewing gum, wet wipes and takeaway coffee “paper” cups. Take away paper cups are often lined with plastic. Avoid microplastic. Plastic pieces smaller than 5 mm in length are called microplastics. Microplastics have been found everywhere from the deepest part in the Mariana trench to inside animals and humans. We don’t know yet how harmful microplastics are to humans or animals. They might be made of toxic materials, or work as vectors accumulating and spreading toxins, bacteria and viruses. Do yourself and the ocean a favour, buy cosmetic products such as toothpaste, shampoo, makeup and conditioners without microplastic. Recycle. Even though plastic can cause harm, it is still a valuable resource. Since it is not biodegradable, rather sort your rubbish and send your recyclable plastic to a new life. That way, it is being reused and discourages the production of more. Beach and ocean cleanups. Our turtle Conservation volunteers are not afraid of hard work and getting their hands dirty. 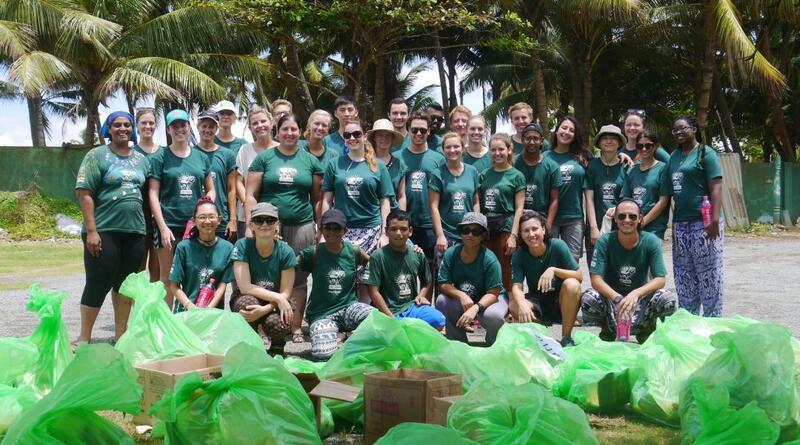 They regularly participate in beach cleanup projects and our diving volunteers in Fiji, Thailand and Belize tackle the underwater rubbish problem. We record data about the type and amount of rubbish we find. This is shared with local governments and other organisations that work towards environmental and wildlife conservation. The data is then used to create or improve environmental strategies. At Hunting Caye beach in Belize, our Belize Conservation volunteers removed rubbish deeply ingrained in the sand to improve nesting conditions. As a result, we were later able to document two turtle nests and 11 crawls. Taking care of injured turtles. Sadly turtles get injured due to entanglement or ingested plastic. At our turtle volunteer programme in Mexico, we have the local government’s permission to rehabilitate injured turtles. If possible, we release the turtles back into the wild. Education is key. All of our Conservation Projects focus on raising awareness and knowledge about the environment and its protection. Our turtle Conservation volunteers visit schools and community centres and talk about the environment, recycling and how plastic pollution is killing turtles. Patrolling. 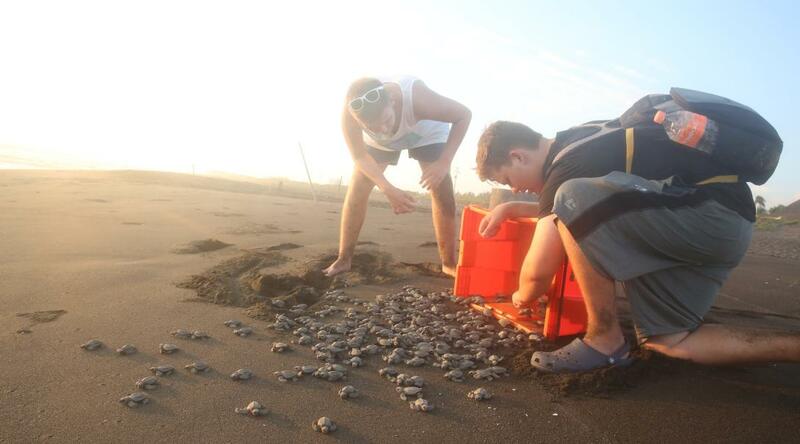 Our turtle Conservation volunteers in Mexico and Conservation volunteers in Peru, patrol beaches day-and-night to find turtle nests. They then relocate the nests to safe sand incubators. By doing this, we are able to save turtle eggs from poaching. When the eggs hatch, we release the hatchlings onto a clean beach. This is to make sure that the hatchlings get the best start on a clean beach. Wildlife survey. By observing and counting turtles and other marine wildlife species, our turtle Conservation volunteers monitor the health of different ecosystems. In Peru, Conservation volunteers released over 1,000 baby yellow-spotted Amazon river turtles back into the wild, bringing our ongoing total to 20,000 hatchlings saved in the last 13 years. These animals are fundamental to the health of the aquatic ecosystem of the rainforest. They are also indicators of healthy rivers, so populations need to be maintained. Planting mangroves. Mangrove forests are amazing habitats for wildlife, and protect turtle nesting beaches from coastal erosion. We plant and cultivate mangroves on our Conservation Projects in Belize, Mexico, Fiji and Thailand. Neither you, nor I, can save sea turtles alone, but we can all do our part. Let’s put our efforts together and make sure sea turtles exist in our oceans for future generations.